Summary: A new strategic approach is needed to end the dispute over the South Kuril Islands that plagues Russia-Japan relations. Solving the issue is in the interest of both countries. The dispute over the South Kuril Islands continues to plague Russia-Japan relations. Though Russia administers the four islands, Japan claims them as its own. A new strategic approach to the issue will finally settle the border between the two Pacific neighbors and help Moscow and Tokyo enhance their standing in the changing Asia-Pacific region. Solving the dispute is in the interest of both countries—Russia will gain a valuable partner to build up its underdeveloped eastern provinces and Japan will gain a new ally that will improve its security in Asia. The South Kuril Islands issue will not resolve itself or become increasingly irrelevant over time. Solving the dispute over the islands requires addressing economic, political, and strategic affairs. But qualitative improvement of relations between Russia and Japan in these areas requires resolving the island problem. The only conceivable solution is a compromise between the official Japanese position of transferring all four islands to Japan and the offer made by Moscow in 1956 to hand over two islands equivalent to 7 percent of the territory. Leaders in both countries must have enough support to make the necessary compromises. Russia must give up more than many Russians think and Japan needs to receive less than most Japanese believe it ought to. Russia should give up Shikotan and Habomai. These two islands cover only 7 percent of the territory claimed by Japan, and Moscow already agreed to hand them over under a joint declaration in 1956. Japan should support economic activity in the islands and in Russia. Direct public sector investment and positive economic incentives for Japan’s private sector will foster economic growth in the islands and Russia’s Far East and Siberia. Russia and Japan should establish a joint economic zone. Run by a Russian-Japanese authority administering a distinct economic and legal regime, a joint economic zone covering all four islands will help develop the area. Russia and Japan must reach a political agreement. The entire area needs to be demilitarized, and Russia should initially continue to exercise sovereignty over the other two islands, Iturup and Kunashir. Eventually, all of the islands should be integrated into Japan. After fifty years, Iturup and Kunashir will transition to Japanese law and sovereignty. The joint economic regime will continue for another fifty years, and Russian permanent residents will be free to stay on the islands. For close to seven decades the dispute over the South Kuril Islands, which the Japanese refer to as the Northern Territories,1 has marred relations between Russia and Japan. Yet, the world around the disputed area has changed dramatically. The thirty-year confrontation between Moscow and Beijing gave way to a strategic partnership supported by substantial trade links. Yet, China also grew visibly stronger than Russia, reversing the situation of the last two-hundred years. The United States, reacting to China’s challenge and seeking to prevent Beijing’s regional hegemony even as it has become almost inextricably linked with China economically, is pivoting to the Asia-Pacific, which has overtaken the Atlantic as the world’s top and most dynamic marketplace. And the rapidly shifting combination of economics, power politics, and different worldviews is redefining international relations in East Asia and the North Pacific. The rapidly shifting combination of economics, power politics, and different worldviews is redefining international relations in East Asia and the North Pacific. Strikingly, Japan and Russia, the two countries that competed against each other in Northeast Asia during the first half of the twentieth century and challenged the United States economically (in the case of Japan) and militarily, ideologically, and politically (in the case of the Soviet Union) during the century’s second half, have remained largely on the sidelines as the new century sets in. Despite the vast difference in the area they occupy, the varying levels of economic and societal development, and the dichotomy between a continental nation and an island one, similarities between the two countries are apparent. Japan and Russia have almost equal populations, low and declining birthrates, are in the midst of—admittedly very different but equally prolonged—crises of their respective political and socioeconomic systems, and are in clear need of reenergizing themselves. For different reasons, they feel insecure and feel like they are losing out in global and regional competition. Yet, at the same time they maintain a relationship that only guarantees that they miss valuable opportunities to improve their own situations. The South Kuril Islands dispute is a telling symbol of a poor bilateral relationship. The South Kuril Islands dispute is not the root cause of the sorry state, but it is a telling symbol of the poor bilateral relationship. Solving it would help unblock the resources that each of the two countries can provide for the other. Moscow and Tokyo need to embrace a strategic approach that will not only fix a mutually recognized border between the two neighbors, but, more importantly, enhance both countries’ standing in the Asia-Pacific by means of a wholly revamped relationship between them. Russia would gain much broader access to potentially the biggest external resource in the region to help develop its eastern provinces: Siberia and the Pacific seaboard. Their underdevelopment is the most important geopolitical challenge that Russia is facing now and in the foreseeable future. The vision of Japan as a Germany in the east for Russia should be compelling to Russian strategists. As for Japan, it would bolster its existential alliance with the United States with a strategic link to the one country in the eastern part of Asia that harbors no historical grudge against Japan and is prepared for close and comprehensive cooperation with it. After all, Germany’s Ostpolitik not only benefitted Russia, but also paved the way to Germany’s unification and secured its position in Europe. Russia and Japan first established official ties in 1855 when they concluded the Treaty of Shimoda. That treaty, signed only two years after Japan was “opened up” to the United States, gave Russian merchants access to Japanese ports. The Russian Empire at the time was “pivoting to the east” after the humiliating defeat in the Crimean War. It was busy consolidating its possessions in eastern Siberia and along the Pacific seaboard, pushing to control the Amur and Ussuri Rivers. Eventually, it was prepared to give up its position in Alaska (1867) and the faraway outposts such as Fort Ross in California to focus on Northeast Asia. The Japanese lay great emphasis on this treaty, and the anniversary of its signing, February 7, has been marked since 1981 as the “Day of the Northern Territories.” The treaty, however, failed to settle the final status of Sakhalin, known in Japanese as Karafuto. The island was intended to be administered jointly, but the lack of partition led to numerous conflicts between Russian and Japanese sailors and merchants. The 1875 Treaty of St. Petersburg saw Japan give up its portion of Sakhalin to Russia in return for Russia ceding the Kuril Islands to Japan. The Russian-Japanese border was then fully settled. The peaceful relations and resolution of disputes by diplomacy led only so far. Even as Russia built the Trans-Siberian Railway and embarked on a policy of expansion in Manchuria, Japan pushed into Korea. Hardline imperialist approaches triumphed in both countries, resulting in a war that ended in victory for Japan. The 1905 Treaty of Portsmouth concluding the war saw Russia not only cede the lease on Port Arthur to Japan, but also the sovereignty over the southern half of Sakhalin Island. Over the next thirty years Japan rose to control much of East Asia and the Russian Empire transformed itself into the Soviet Union. Japan consolidated its control over Manchuria and the Soviet Union established Mongolia as a de facto puppet state. Tension turned to conflict in a series of border fights that occurred from 1932 to 1939 and ultimately culminated in the Japanese defeat at Khalkhin Gol in 1939 and a subsequent Soviet-Japanese Neutrality Pact in 1941. That pact was renounced by the Soviet Union after the end of World War II in Europe, and in accordance with its Yalta Conference obligations to the Western allies, the Soviet Union attacked the Japanese forces in Manchuria and Sakhalin on August 9, 1945. By August 14, Japan had accepted defeat and the next day announced the termination of the war in the Pacific. However, hostilities on the continent continued for a few more days. And on August 18, the Red Army launched the invasion of the Kuril Islands, conquering the entire chain between Kamchatka and Hokkaido by early September. On September 2, 1945, Japan signed an act of unconditional surrender. The occupation of Japan by U.S. forces, the victory of the Communists in the civil war in China, the Korean War, and, of course, the Cold War set the context for Soviet-Japanese relations in the immediate post–World War II period. In this environment the Soviet Union refused to sign the San Francisco Peace Treaty with Japan in 1951. This failure had important consequences. Under the treaty, Japan ceded southern Sakhalin and the Kuril Islands, but the beneficiary was not indicated in the treaty. Nor were the Kuril Islands defined and specifically listed. At the time, Moscow treated Japan as a U.S. military base and thus an adversary in the Cold War. During the first brief détente in that new confrontation in the mid-1950s, however, the Soviet Union began partially normalizing relations with its former enemies. Following the unilateral Soviet declaration of 1955 ending the state of war with Germany, the Soviet Union and Japan signed a joint declaration in 1956 formally ending the state of war between the two countries. Under the declaration, which was a legally binding document ratified by the Supreme Soviet and the Japanese parliament, Moscow agreed to hand over to Japan the Habomai and Shikotan islands once a formal peace treaty was signed. The absence of a peace treaty between the Soviet Union and Germany was the result of Germany’s political division. With Japan, the reason was the territorial dispute. While the Soviet Union was willing in 1956 to hand over to Japan the tiny islands just off Hokkaido, Japan’s claims to two larger islands, Kunashir and Iturup, were left unaddressed. The joint declaration proved only a brief respite in Cold War hostilities. The United States and Japan updated and deepened their security relationship with the 1960 Treaty of Mutual Cooperation and Security. That treaty was signed despite protestations from Moscow, which preferred Japan to be neutral and demilitarized. In response to the U.S.-Japan treaty, the Soviet government withdrew its signature from the 1956 joint declaration until all U.S. military bases leave Japan. Until the end of the Cold War the status quo over the South Kuril Islands remained unchanged. The Soviet Union did not even recognize the existence of a territorial dispute with Japan and treated the entire chain of islands between the Sea of Okhotsk and the Pacific Ocean as an integral part of its sovereign territory. This fact, however, did not preclude a considerable expansion of Soviet-Japanese economic ties in the 1970s and 1980s. The end of Communist rule in Russia and the dissolution of the Soviet Union, however, reopened the issue and gave rise to various attempts to solve it. So far, all attempts have failed. Even though the solutions proposed since the early 1990s to settle the territorial issue between Japan and Russia have not worked, they provide a wealth of material that is useful to anyone who wishes to construct a better future for both countries. The Japanese insistence on the handover of the entire Northern Territories area, namely, Iturup, Kunashir, Shikotan, and Habomai, is clearly a nonstarter. The window for that solution may have existed at the very end of Mikhail Gorbachev’s rule, but Tokyo was more skeptical about perestroika than other Western capitals and, regardless, the invitation for Gorbachev to visit Japan came too late, in April 1991. Today, Japanese appeals to historical justice do not strike a chord with most Russians who generally see the Soviet (and now Russian) possession of the islands as the price Tokyo had to pay for its role in World War II. Giving them up entirely would be seen in Russia as totally unwarranted, and an act of high treason. And of course Russians realize that Tokyo cannot impose this solution on Moscow. Thus, the Russian equivalent to the Japanese desire to claim the four islands is something that might be called a zero solution (or in other words, the perpetuation of the status quo). But no matter how strongly Moscow may reject the very notion of a territorial dispute with Japan, the problem will not go away. Nearly seventy years after the end of the war, and with nearly all former Japanese residents of the islands dead, the Japanese are still raising the issue. And a few more decades are unlikely to change this. Realizing this, the Kremlin repeatedly offered to Tokyo—in 1993, 2001, and 2006—to solve the issue on the basis of the 1956 joint declaration. This would result in a peace treaty under which Shikotan and Habomai (basically a collection of rocks) would be handed over to Japan. The two island territories, however, together represent a mere 7 percent of the area claimed by Japan. Not surprisingly, there were no takers in Tokyo. Other, informal ideas aired over the years changed the percentages but not the underlying framework. One plan would have been to transfer three of the four southern islands (Habomai, Shikotan, and Kunashir) to give Japan 37 percent of the total area. Another idea was a 50–50 split, perhaps modeled on the 2004 border settlement between Russia and China, which would give Japan the three southern islands plus a portion of the biggest island, Iturup. Land concessions can induce passion, but when they are relatively peripheral, as the South Kuril Islands certainly are for both countries, the issue can be captured by narrow but dedicated interest groups.5 For the South Kuril Islands, local Russian activists and the Japanese League of Residents of Chishima6 and Habomai Islands have effectively prevented resolution of the dispute. The former warns the Russian government against changing the status quo and the latter prevents the Japanese government from accepting anything other than maximal concessions. Ultimately, there are five general lessons that can be learned from previous experiences. First, the South Kuril Islands issue will neither “resolve itself” nor become irrelevant over time. Second, a backward-looking solution does not work, so there needs to be a forward-looking one with an entirely new narrative. Third, the issue of the islands will not be solved in separation from economic, political, and strategic issues, but qualitative improvement of economic, political, and strategic relations between the two countries requires solving the island problem. Qualitative improvement of economic, political, and strategic relations between Japan and Russia requires solving the island problem. In the end, the South Kuril Island issue can only be solved within the context of a fundamentally new strategic approach, with Moscow and Tokyo viewing the other party as a valuable resource for their own interests. The Russian government’s current economic plan for Siberia and the Far East is more funding and more centralized control. The plans for creating a regional development fund, a state corporation, and now a special ministry for the region all point in the same direction, which is not promising. Instead, Russia needs to fully use the economic potential of the neighboring Pacific region to develop its eastern territories. Following the recent improvement in relations with China, transforming relations with Japan would constitute a sea change in this regard. In particular, Japan will help Russia move toward an economy that is not reliant on natural resources—but one that thrives on information technology, space technology, and education. And President Vladimir Putin’s desire to boost Russia’s standing in the World Bank’s Doing Business Index goes hand in hand with this. A new relationship with Japan that ensures Japanese companies invest in Russia beyond natural resources will help large-scale investments from China develop Siberia and the Far East. To put this most succinctly, Russia needs partners to help unleash the economic capacity of its resource-rich but underdeveloped areas and to raise the living standards of its population. Seen from this angle, Japan is a major external resource for Russia’s development, particularly in Siberia and the Far East. Among Russia’s neighbors in Asia, Japan is the most advanced economy and it can be a source of capital investment and technology transfers. Conversely, Japan is a market for Russia’s traditional exports—oil, gas, coal, timber, and metals—and a valuable partner for a range of logistical projects. Politically, a fully normalized relationship with Japan would strengthen Russia’s position in Asia, not least vis-à-vis China. A completely demilitarized relationship with Japan, a country Russia fought twice in the previous century, would materially improve Russia’s security situation in the Pacific and add to the security community that Moscow has already built with a number of countries in Europe and Asia—from Germany to Finland to Turkey. In fact, Moscow should strive for a relationship with Japan that is of the same kind and on the same scale as the one it has successfully built with Germany. The two horrific wars in the twentieth century notwithstanding, today’s Germany is Russia’s closest partner and perhaps its best friend among the bigger countries of the West. Gaining a similar partner in the east would produce clear benefits in all relevant areas: trade (bilateral trade with Japan reached $30 billion in 2011, but this falls far short of $83 billion with China or $72 billion with Germany), investment, science and technology, education, healthcare, transportation, and human relations. Of course, no two situations and no two pairs of countries are ever completely alike, but a Germany in the Pacific would make Russia’s global position much more sustainable. In the same vein, Japan needs Russia to create a better balance for itself on the continent of Asia. Of all of Japan’s neighbors in Asia, Russia has the most natural resources, the greatest strategic depth, the most developed—if somewhat archaic—global mindset, and the most formidable weapons arsenal. Russia is probably the one country in Asia that does not fear China and, though the power ratio has reversed, is still able to keep the relationship with Beijing on an even keel. Strikingly, Russians are generally much friendlier toward the Japanese than the other way around. They have healthy respect for Japan’s achievements and admiration—even some passion—for its traditional culture. When China’s northern neighbor and strategic partner warms up to Japan, the Japanese people will have every reason to feel more secure. There is in fact precedent for just this line of thinking. The basis for the current partnership between Russia and Germany started in the 1970s with West German chancellor Willy Brandt’s Ostpolitik and the series of treaties he negotiated with the Soviet Union, Poland, East Germany, and Czechoslovakia that recognized the political and border changes resulting from World War II. West Germany gave up its territorial claims to large chunks of its former empire, including Koenigsberg (now Kaliningrad), the coronation city of Prussian kings, in exchange for larger economic opportunities, the reduction of tensions in the region, and greater room for diplomacy. Over the diehard opposition of some, Brandt reached out to Moscow. The Soviet Union and its Warsaw Pact allies, for their part, needed the material benefits that came from direct, broad, and unencumbered interaction with West Germany. Moscow also strengthened its position in Europe and vis-à-vis the United States. This is not to say that the Americans were disadvantaged by their key ally coming to terms with their principal adversary in the Cold War—the payoff was stability and more predictability along the Cold War’s central front. Such an approach paid even more dividends two decades later as Moscow supported Germany’s unification, and a united Germany—also a member of the North Atlantic Treaty Organization—became Russia’s key partner in the West. It is important to remember that until West Germany and the Soviet Union could come to a conclusion over World War II, they were unable to transform their relationship into something truly satisfying. So long as the dispute over the South Kuril Islands remains unresolved, Moscow will not be able to transform its relationship with Tokyo into one resembling the current Russian-German partnership. This makes it more difficult for Russia to embrace its Euro-Pacific future. Just as the more recent and still ongoing historical reconciliation with Poland is regarded as absolutely necessary to unblock Moscow’s relations with the European Union and link Russia in a security community with the West, a turnaround with Japan will bolster Russia’s position in the North Pacific. Renewing the idea of an Ostpolitik in the Asia-Pacific does not upend the 1945 legacy in Europe, nor does it betray the sacrifice of the Russian people in the Great Patriotic War of 1941–1945. The South Kuril Islands are more in the league of historical strategic outposts like the naval bases in Port Arthur and the Hanko Peninsula in the Gulf of Finland that were transferred in 1953 to China and 1956 to Finland, respectively. Similar steps have been made in more recent times when Putin decided in 2000 to abandon former Soviet military facilities in Cuba and Vietnam. Also, Russia’s deals with China in 2004 and Norway in 20108 both resulted in Russia’s giving up part of its administered territory or its long-standing legal position, but it is safe to believe that settling the South Kuril Islands issue will not bring about new claims from either China or Norway. Firmly fixing Russia’s borders along the country’s entire perimeter is a long-standing policy and the islands in the Far East should not be allowed to remain a black hole in this priority. By reaching a creative accommodation with Moscow, Tokyo will demonstrate its forward-looking approach and flexibility, which will significantly burnish its international reputation. By the same token, if Japan climbs down from its maximalist position, this should not create problems with China and South Korea, two countries Tokyo also has disputes with over island territories. And by reaching a creative accommodation with Moscow, Tokyo will demonstrate its forward-looking approach and flexibility, which will significantly burnish its international reputation. The narrow but passionate argument that territory can never negotiated over has been proven wrong during the past decade by Russia’s actions, and by none other than Putin himself. The proposed deal with Japan will make Russia feel safer, just like the 2004 deal with China, and help Russian economic development, bolstering security in the most vulnerable part of the country. Rather than weaken Russia, it makes it stronger if the deal emerges as part of a fundamental transformation of Russian-Japanese relations and within the context of government policies that make the country more friendly toward investment. The territorial settlement needs to be embedded within the broader strategic shift in Russian-Japanese relations. Without a mutual willingness to fundamentally transform the relationship, the solution will remain out of reach, and both countries will continue to forfeit the opportunities that they so badly need to upgrade their economic and strategic positions. Russia should immediately and fully give up the two islands—Shikotan and Habomai, covering 7 percent of the territory claimed by Japan—that it already agreed to hand over under the 1956 joint declaration. The reason given by the Soviet government to cancel that accord is no longer relevant as the U.S. military bases in Japan are not a direct threat to Russia with the Cold War long over. Japan should begin supporting economic activity in the South Kuril Islands and across Russia through direct public sector investment and positive economic incentives to its own private sector. Russia and Japan should establish a joint economic zone covering the four South Kuril Islands that is run by a Russian-Japanese authority administering a distinct economic and legal regime. Russia and Japan must reach a political agreement that underlies this economic arrangement. From the beginning, the entire area will be demilitarized. Russia will continue to exercise sovereignty over Iturup and Kunashir. Russian civilian migration to these islands, likely resulting from new economic activity, will not be restricted and Japanese people will be free to move to all four islands. At the end of a fifty-year period, Iturup and Kunashir will transition to Japanese law and sovereignty, but the joint economic regime will continue for another fifty years and Russian permanent residents will be free to stay, enjoying the right to hold dual citizenship of Japan and Russia. Thus, the South Kuril Islands will resemble Hong Kong in that they will eventually be integrated with Japan, but for the first fifty years most of them will remain under the Russian flag and at the end of this period all the islands will be legally part of Japan, but with a special economic regime for another fifty years and with a strong Russian presence. Fears in Russia of Japan reneging on some aspect of the deal will be prevented by the presence of a large group of Russian nationals on the islands. Their presence will be a guarantee of Russia’s continuing interest. For this to be possible will require strong political will and sufficient political support for transformative strategies in both Russia and Japan. Success will hinge on the ability of the national leaderships in both countries to break out of the surviving Cold War mindsets, convince their electorates to turn the page, and receive the popular mandate for the transformation. The Japanese parliament and political parties must be persuaded to reduce nationalist rhetoric. If rhetorical demands in Japan fall and create the opportunity for the agreement, then opposition to the deal in Russia could be managed. Declarations from the heads of state or legislatures of Germany and Finland to reaffirm that the resolution formula for the South Kuril Islands issue has no bearing on the status of Kaliningrad and parts of Karelia as legal territories of Russia will also help. This will certainly strengthen the Russian president against domestic opposition to a deal with Japan. And the United States, for its part, should adopt a benign attitude and support the deal. In contrast to the Cold War period, when the United States opposed any serious rapprochement between Moscow and Tokyo, there is no major U.S. interest that could be served by the continuing dispute. Indeed, a closer Russian-Japanese relationship will help stabilize the Asia-Pacific region and be beneficial for the U.S. strategy in the region. This new idea for solving the dispute provides an institutional resolution to problems of unpredictable investment climates. The islands will have an entirely new economic system that will benefit from institutional arbitrage, latent economic potential in Russia, and sources of capital in Asia with only tangential relations to the below-ground economy that the current Russian state relies upon. Moving even further ahead, Russia is not so much giving up the islands as gaining a Hong Kong and the long-term beneficiary would be the entire Pacific coast of Russia. Vladivostok would become a Russian Shanghai. Russia does not currently have a strategy for the Asia-Pacific region and Moscow has so far failed to exploit the power of globalization, but Asian involvement in Siberia and the Far East will correct these problems. The new Hong Kong in the north will allow Siberia and the Russian Far East to meet both Asia and America through the Pacific, which is exactly what virtually all other countries in the region are doing. This historical fortress and resource base for raw materials will be literally transformed into a motor and model for a new above-board and above-ground economy. A fundamental transformation of Russian-Japanese relations is bound to have a major impact on the regional situation in East Asia and the North Pacific. China, North Korea, South Korea, and the United States will all be affected. And this will be generally positive. Stable peace between Russia and Japan is a step toward creating a security community in the North Pacific analogous to the one expanding in the North Atlantic—a situation where inter-state conflicts are handled without the threat or use of force. Japan and the United States achieved this status in their relations in the two decades after the end of World War II. Japan and South Korea, both U.S. allies, are completing the process. If Japan and Russia endow their relationship with a similar quality, even without an alliance between them, this will further stabilize the North Pacific. It is important to stress that a Russian-Japanese rapprochement does not constitute an alliance, particularly one against China. Japan may be concerned about China’s rise and would see a permanently peaceful relationship with Russia as a geopolitical reassurance. Russia, however, would do nothing to undermine its neighborly relationship with China, which is critically important to Moscow. A more reassured Japan should be in China’s enlightened self-interest. And the same goes for a Russia that is better integrated with the Asia-Pacific region and is not entirely focused—for good or for bad—on its relations with Beijing. Indeed, Beijing strategists may conclude that Moscow is pursuing with Tokyo a set of goals similar to those set by China when it sought to improve its own relations with Japan: economic, technological, and scientific cooperation to help national development. A peaceful settlement of the decades-old territorial dispute between Japan and Russia will positively affect other contested island territories in the Sea of Japan and the East and South China Seas. A peaceful settlement of the decades-old territorial dispute between Japan and Russia will also positively affect other contested island territories in the Sea of Japan and the East and South China Seas. Tokyo might use the precedent to move toward final resolution of the Dokdo/Takeshima Islets issue with Seoul, and thus cement its relationship with South Korea. Japan’s constructive approach with Russia and South Korea would serve Tokyo well in the dispute over the Senkaku/Diaoyu Islands, where China would be challenged to match this constructiveness in order to not be seen as overly aggressive and narrow-minded. Delaying resolution to a problem when the conditions are favorable leaves the possibility that circumstances can become even more difficult later on. The last time a movement toward a Russian-Japanese rapprochement looked credible was in the mid-2000s, as the two countries were led by strong and popular leaders, Putin and Prime Minister Junichiro Koizumi, who aspired to upgrade their respective countries’ position on the world scene and were seriously examining the options for a qualitative improvement in bilateral relations. That opportunity was lost. More recently, during the presidency of Dmitry Medvedev and brief tenure of Naoto Kan as prime minister, Russian-Japanese relations experienced acute tensions linked to the territorial issue. With Putin reassuming the presidency in 2012, he is clearly focused on developing the Russian east—Siberia and the Pacific seaboard. He no doubt understands the value of Japan for what might be called his “eastern project” that was exemplified by Russia’s holding the Asia-Pacific Economic Cooperation summit in Vladivostok and the establishment of a special ministry for the Russian Far East in Khabarovsk. Putin is pragmatic enough to realize the importance of land-for-peace deals, having concluded one with China, and he is not averse to land-for-development schemes, having offered Tokyo the reactivation of the 1956 joint declaration. It was the lack of interest on the Japanese side and nationalist rhetoric of Japanese politicians that made the Kremlin show toughness with Medvedev and government ministers visiting the islands. Putin, the “good cop,” is flanked by Medvedev, the “bad one,” and the game goes on. What Moscow needs, however, is a strategy and not just diplomatic tactics or bureaucratic moves. Japan, for its part, should not simply wait for Russia. Tokyo needs to embark on a course that will materially strengthen its geopolitical position without weakening any of its existing relationships, and this means that Japan must start thinking strategically about Russia and come forward with bold initiatives of its own. Of all the Russian leaders on the horizon, Putin, due to his strong patriotic image, is the only one who can be seriously engaged—and who will deliver once the deal is struck. Japan, however, needs to broaden its horizon in order to effectively engage Putin. The issue at hand is not righting perceived historical wrongs. It is not so much the small and largely symbolic Northern Territories at stake, but Japan itself—and its future. Japanese politicians who realize this and act as real statesmen will deserve to be called leaders. There is a clear path forward for resolving the dispute over the South Kuril Islands and establishing deeper relations between Russia and Japan. This is in the national interests of both countries and efforts should be made by Russian and Japanese leaders immediately so the opportunity is not wasted. 1 The Russian name of the area is generally used in the paper as it is more common in English. 2 E. D. Grimm, Sbornik dogovorov i drugikh dokumentov po istorii mezhdunarodnykh otnoshenii na Dalnem Vostoke (1842–1925) [Collected Treaties and other Documents on the History of International Relations in the Far East (1842–1925)] (Мoscow: Institut istorii Akademii nauk SSSR, 1927), 52. See also V. K. Zilanov, A. A. Koshkin, I. A. Latyshev, A. Yu. Plotnikov, and I.A. Senchenko, Russkie Kurily: istoria i sovremennost. Sbornik dokumentov po istorii formirovania russko-yaponskoi i sovetsko-yaponskoi granitsy [The Russian Kuril Islands: Past and Present. Collected Documents on the Formation of the Russian-Japanese and Soviet-Japanese Border] (Moscow: Sampo, 1995). 3 Tatyana Panina, “Nischeta Izobiliya” (The Destitution of Abundance), Rossiiskaya Gazeta, no. 5029 (205), October 29, 2009, www.rg.ru/2009/10/29/primakov.html. 4 Robert D. Putnam, “Diplomacy and Domestic Politics: The Logic of Two-Level Games,” International Organization, 42.3 (1988): 427–60. 5 Mancur Olson, The Logic of Collective Action: Public Goods and the Theory of Groups, vol. 124 (Cambridge, Mass. : Harvard University Press, 1965). 6 The Japanese name for the Kuril Islands. 7 This basic approach was first proposed in the 2005 Carnegie Moscow Center publication, Dmitri Trenin and Vasily Mikheev, Russia and Japan As A Resource for Mutual Development: A 21st Century Perspective on a 20th Century Problem. 8 The China deal sealed the 4,355 kilometer-long Sino-Russian border in its entirety. Russia agreed to the border following the main channel of the Amur and Ussuri Rivers, not their Chinese bank, as had been the case since 1929. Roughly half of the territory of the river islands was thus handed over to China. The Norway settlement fixed the maritime border in the Barents Sea, with Russia agreeing to divide the disputed area on a 50–50 basis. Yuval Weber is a doctoral candidate in the Department of Government at the University of Texas. He is spending the 2012–2013 academic year in Moscow. He is a David L. Boren Fellow, funded through the National Security Education Program, and visiting researcher at the Carnegie Moscow Center and a visiting researcher and invited professor at the New Economic School. This specific proposal for resolving the Kurile Islands' territorial issue I suspect would not be supported by the Sakhalin Region (the Kurile Islands are part of the Sakhalin Region). The issue of the territorial waters and vast fishing grounds, a major concern on Sakhalin, is not mentioned in the article and should be considered. Hopefully this article is being posted in Russian for review by Russian stakeholders. However, Russia's returning to Japan all four islands - two small islands immediately and the other two in 50 years - in exchange for better Russo-Japanese relations resulting in greater Japanese investments to develop the broad regions of the Russian Far East seems a poor bet. The current investment posture of Japanese companies is risk-adverse and they are unlikely to invest heavily in the current Russian Far East investment climate. Investment in Russia is currently open to Japan and the Kurile Islands dispute is only one factor why Japanese aren’t investing the Russian Far East broadly. Many major Japanese corporations currently have offices in the Russian Far East and investments in Russia more broadly. Japan is certainly an attractive partner for Russia in theory. But if Russia gives Japan the four Kurile Islands, Japan could well invest domestically in these islands ignoring riskier investments in the broader Russian Far East regions. The suggestion that Russian nationals on the Islands after a transfer back to Japan would ensure observance of Russian interests has no precedence – not happening in London, not in New York, not anywhere. Once these islands are part of Japan, opportunities for Russian “alien” residents (even with Japanese passports) will reflect those for non-Japanese nationals in the country generally. In short, safe to assume the islands would simply become Japanese over time. From a Russian Far East and I hope Russian Federation perspective, there should be greater and clearer benefit to Russia in a Kurile Islands resolution beyond simply improving Japan-Russian relations. The article proposes a solution with a loss of territory and territorial waters for Russia, and insufficient guarantee of benefit in broader Far East development. I suspect and hope that the Russian Federation will seek a better deal than that proposed in the article. That said, Trenin Raises interesting proposals and covers the history brilliantly. Dear Derek Norberg: from which country are you? Not Ethnic Russian I suppose. Then why to have this very narrow Russian Chauvinist view? These Kuril Islands belong to Japan. And the Shakalin region belongs to Japan. I would like to remind you that the indigenous peoples of the island are the Ainu, Oroks, and Nivkhs.. Sakhalin has been claimed by both Russia and Japan over the course of the 19th and 20th centuries. This has led to bitter disputes between the two countries over control of the island. Russia seized the island from the Japanese near the end of World War II. Most Ainu relocated to Hokkaidō when the Japanese were displaced from the island in 1949. The period of Western invasion and dominance of Asia is over! It's time that the Ethnic Russians go away to this Far East region. It is time that Japan, Korea and China recover this Far East which belong to them. Please quit your "imperialist colonist" mindset and see with the glasses of the XXIst century - the century of the Asian renaissance. Last - you really think that the Far East will be let to Ethnic Russians? Have you not noticed that during the XXth centuries many changes happen - sometimes through wars. Do you really think that the XXIth century will be smoothed and quiet , that they will be no major changes between countries, no more war? Even nuclear? I don't believe it! Yes the only way that the Russians could defend themselves today seems to be nuclear bombs - but are you sure that they will be able to use them? Are you sure that in front of an unified North Asian Front composed by China, Japan, Korea, they will hesitate to use atomic bombs. These Asian countries have allies - and probably in this case will have more like Pakistan or Iran or Turkey and quite surely for Japan USA and the European countries. It will be in their interests to help the Asian countries. Russia has no ally - none...not even Belarus. Once more Mr.Dmitri Trenin thinks like a Soviet guy - with no vision except the one of a Russian Chauvinist. Let break this very narrow and Soviet bureaucratic vision. The first question is simple and it is the way that the Asian countries from this areas are thinking about it - at least surely China, Korea ( North and South) , Japan and a little bit less concern Mongolia and Taiwan - and of course USA but in the background. The questions that they are all asking themselves are: why in the XXIst and XXIInd centuries Siebria and all the East of what is now the so called "Russian Federation" should belong to these Ethnic Russians who are today around 111 millions and will be probably in 2050 around 100 millions and in the East part around 16 millions today and probably around 13 millions in 2050? What is the legitimacy of their occupation of this large land where there is mainly commodities that these Asian countries need and that these Ethnic Russians and their government is incapable to develop? Why not to take back this part of territory which has always belong to the Asians except the last two centuries? It is absurd to oppose the will of around -today - 1,450 billions very active people in front of just 16 millions of Ethnic Russians quite lazy and uneducated! In the long strategic term it has no meaning. The Ethnic Russians must of course in the course of the XXIst century must go away from this area - peacefully or by force. In any case it is a movement which has started in 1905 and will not be stopped due to the nature of the forces in presence. Part 2 To take an example - the one of the so called city of " Vladisvostok" . A very brief resumeof the history of this Chinese city. "The name Vladivostok loosely translates from Russian as "Ruler of the East"—a name similar to Vladikavkaz which means "Ruler of the Caucasus". In Chinese, the city was known since the Qing Dynasty as Hǎishēnwǎi (海參崴, meaning "sea cucumber cliffs"). In modern day China, it is known by the transliteration Fúlādíwòsītuōkè (符拉迪沃斯托克), although its historical Chinese name Hǎishēnwǎi is still often used. The Japanese name of the city is Urajiosutoku (ウラジオストク; a rough transliteration of the Russian originally written in Kanji as 浦塩斯徳 and often shortened to Urajio; ウラジオ; 浦塩). In Korean, the name is transliterated as Beulladiboseutokeu (블라디보스토크) in South Korea, Ullajibosŭttokhŭ (울라지보스또크) in North Korea, and Beullajiboseu-ttokeu (블라지보스또크) by Koreans in China. Moreover, there's the English name of the city Port May which was given in 1856 when English naval ship visited the gulf." "The aboriginals of the territory on which modern Vladivostok is located are the Udege minority, and a sub-minority called the Taz which emerged through members of the indigenous Udege mixing with the nearby Chinese and Nanai. The region had been part of many states, such as the Mohe, Balhae, Goguryeo, Jīn Dynasty, Yuan Dynasty, and various other Korean and Chinese dynasties, before Russia acquired the entire Maritime Province and the island of Sakhalin by the Treaty of Beijing (1860). Qing China, which had just lost the Opium War with Britain, was unable to defend the region. The Pacific coast near Vladivostok was settled mainly by the Chinese and Manchus during the Qing Dynasty period. A French whaler visiting the Golden Horn Bay in 1852 discovered Chinese or Manchu village fishermen on its shore. The Manchus banned Han Chinese from most of Manchuria including the Vladivostok area—it was only visited by illegal gatherers of ginseng and sea cucumbers. On June 20 (July 2 Gregorian style), 1860 the military supply ship Manchur, under the command of Captain-Lieutenant Alexey K. Shefner, called at the Golden Horn Bay to found an outpost called Vladivostok. Warrant officer Nikolay Komarov with 28 soldiers and two non-commissioned officers under his command were brought from Nikolayevsk-on-Amur by ship to construct the first buildings of the future city. Part 4 My logical proposal ( counter-proposal to the totally Russian Chauvinist's one my by our dear Dmitri Trenin) is that Japan and Chinese will not repeat the errors they did in the 1930's opposite to what they have most probably discussed - at least between Sun Yat-sen and Ikki Kita in 1902-03 . A way to solve their dispute concerning the Diaoyutai Islands is to agree that these Islands are Chinese but to make together the exploitation ( if any) of their commodities resources ANF that China and Japan fight together to recover from Russia what belong to them : for Japan 100% of the Kuril Islands and for China the Chinese city Hǎishēnwǎi (海參崴, meaning "sea cucumber cliffs") which is named today stupidly "Vladivostok" plus the entire Maritime Province and the island of Sakhalin which has been stolen by the Ethnic Russians by the Treaty of Beijing (1860). Qing China, which had just lost the Opium War with Britain, was unable to defend the region. The Pacific coast near Hǎishēnwǎi (海參崴,) was settled mainly by the Chinese and Manchus during the Qing Dynasty period. It will remind all the Asian countries how deeply they have enjoyed and they have been proud of the victory by the Japanese against the Ethnic Russians in 1905. It will revive an Asian tradition of victories against the Ethnic Russians. It will a way to create an Union between North Asian countries ( China, Japan, Korea, Taiwan) to push out these un-educated and underdeveloped Ethnic Russians who have nothing to do in this part of the World ( in the East part of what is called today the Russian Federation). It will be the first step to re-conquer all Siberia and all the East part of the so called "Russian Federation". Because China and Korea are in the same continent as the Europeans - and because they appreciate each other - in the long term, it will be logical that an Union between the two Unions ( EU and Asian one) will be made. Between them it will be decided what to do with the around 100 milllions of Ethnic Russians - either to create a new Chinese province either to make them part of EU - but I doubt that the Europeans want these under- developed and uneducated Ethnic Russians who have been unable these last twenty to even create a democratic political system. My Asian vision is a realistic one which has at least 80% chance to happen in the three, five decades to come. But what is three, five decades in the perspective of Chinese History! Mr. WalterasBenjamin. The Russian Far East, Sakhalin and the Kuril Islands all are the territory of the Russian Federation. This was established at the close of WWII. 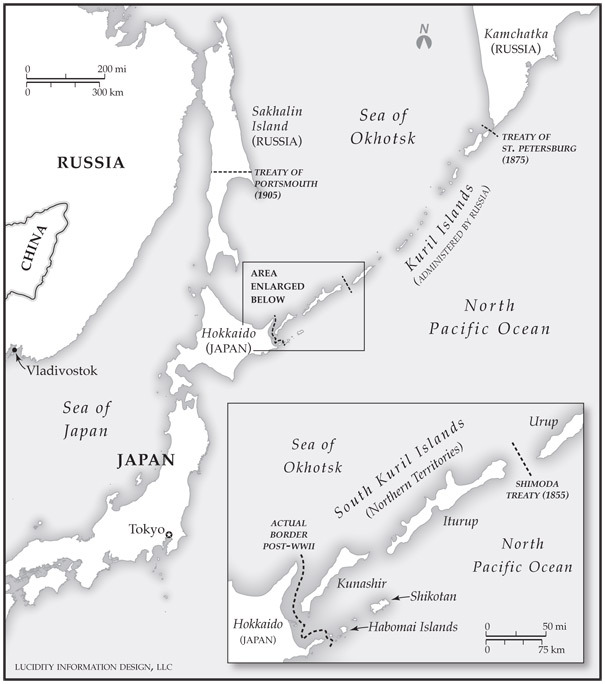 Japan does not dispute Russian posession of Sakhalin Island nor of the Kuril Islands (as you do), but only argues the "Northern Islands" (Southern-most four islands of the Kuril chain) are not part of the Kuril Islands. Your adding Chinese territorial claims that are nor relevent to the Trenin article is not constructive to this discussion seeking a solution to the Japanese-Russian dispute. Japan lost these territories to the Soviet Union undfer general agreement with the U.S. Trenin's article covers that history well. The precise definition of the Kurils and the Southern four islands of this chain was never clearly defined in the terms of agreements and that is the basis for Russian-Japanese negotiation now. But these territories are currently part of the Russian Federation. The way forward is to find a solution that works for both the Russian and the Japanese sides. As Russia holds the territory, the onus may be on the Japanese to propose a solution that addresses Russian needs. The proposal in Trenin's article fails this test and seems overly favortable to the Japanese with insufficient benefit for Russia. Your disdain of the Russian people as "lazy and uneducated" indicates you have no intent to be taken seriously. Russia ceratinly has its problems, but Russians are some of the best educated people on the planet. You fault the Russian democratic progress over the last 20 years, but at least the Russians threw off communism and do hold elections. By comparison, how does your "Asian Vision" rate democratic evolution in China? You ask my nationality. I am American (U.S.) but consider my views neither Russian Chauvinist or imperialist. I harbor no malice towards Japan and hope for successful resolution of any issues complicating international relations between Japan and Russia. I work in the field of international economic cooperation in the North Pacific between the U.S. and Russia, and I welcome enhanced Russian-Japanese cooperation in that equation. Increased U.S.-Japanese cooperation on projects in the Russian Far East, could be a very fruitful approach for all sides. So I am in favor of international inclusion and cooperation in Eastern Russia benefiting all participants, and of course Russia. I think it is very interesting proposal although it is a bit unrealistic. I hope that this will become the basis for the talk between Prime Minister Abe and President Putin! This dispute must be resolved in order for Japan and Russia to sign the peace treaty!